You’ve probably heard by now about Pokémon Go and how the new game is sweeping the nation. If you haven’t heard about it, have you noticed large numbers of people wandering around your town looking at their phones? Or gathering in parks or on sidewalks? That’s probably what they’re doing! Once you realize what’s happening, it’s pretty funny to watch! What does Pokémon Go have to do with the topic of family finances? Well, I’m always on the lookout for ways to have free family fun, and this is a really good one! Assuming you already have a smartphone with internet access, Pokémon Go could provide many hours of fun at no cost. It also encourages exercise and can be social too! If you’re a parent and thinking this is just for the kids, you also might be surprised to find yourself getting pulled into the fun. 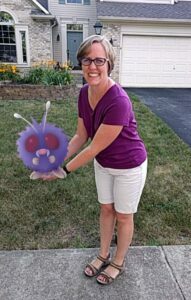 My kids are actually away at summer camp right now… but my husband and I just spent half the day chasing Pokémon around the neighborhood! Now I’m a little sunburned, but I have almost 13,000 steps on my Fitbit! Pokéstop: Location in the real world where you can collect free supplies like Pokéballs, used for catching the Pokémon. Gym: Location in the real world where you go to fight with your Pokémon. The basic idea of the game is that you walk around in the real world with the game active on your phone, showing a map. If there’s a Pokémon nearby, your phone will vibrate, and you can try to catch it by tossing Pokéballs at it. When you try to catch it, the game uses your phone’s camera to show the Pokémon in the real world (standing in the grass or on your friend’s head – whatever is in front of you!). You can also use the camera feature in the game to snap a picture of the Pokémon in funny places. Don’t underestimate how entertaining this aspect of the game can be! That’s me holding a Pokémon! In order to catch Pokémon, you must have Pokéballs, and they are a consumable item. You can get more Pokéballs at the Pokéstops, which are generally located at parks, libraries, and other public places. The Pokéstops might also give you other supplies like healing potions or eggs. Eggs can be hatched into Pokémon by being incubated. In order to incubate the eggs, you must walk a designated distance (generally 2-10 kilometers). This is another part of the game that encourages exercise! Once you have collected some Pokémon, you can use them to fight at a gym. Gyms are other locations in the real world and are not the same as Pokéstops. Also, be aware that since Pokéstops and Gyms are generally landmarks, if you are in a rural area with no parks or other landmarks around, the game will probably not be very fun. Pokémon can appear anywhere. They can be in your backyard or a cornfield, but you won’t be able to get more free supplies without any Pokéstops around. You also won’t be able to use the Pokémon for fighting without a Gym around. I will not go into the details of game strategies, since I’m not an expert gamer. I want to focus on the concerns a parent may have about being safe and financially responsible while having fun. Use the buddy system. It’s always safer to do outdoor activities with a friend. Encourage your children to take a friend or sibling along for the hunt if they’re going without a parent. Watch for traffic. It’s very easy to get lost in the game and not pay attention to passing cars. Make sure they follow all the traffic rules, use crosswalks, and watch for cars. Be aware of the time and place. Is it ever a good idea to hang out in a dark alley at 2am? Of course not! Encourage kids to be sensible with the time and place of their Pokemon hunts. Don’t drive while catching Pokémon! If you have a teen driver, it’s a good idea to remind them that it is unsafe to use a phone while driving. If they want to drive around to Pokéstops, they should take a friend to handle all the Pokémon from the passenger seat. Watch your phone battery level. The game uses up phone battery pretty quickly, so you might want to make sure you have enough battery power left for making any necessary emergency phone calls. Don’t accidentally spend money. It is possible to spend money in the game to buy more supplies. If you’re allowing a child to use your phone, make sure that there’s a pin set for purchases so the child doesn’t accidentally spend money buying extra Pokéballs! You may also want to explain to your child in advance that you won’t be spending real money on any Pokémon supplies. Keep an eye on your mobile data usage. Unless you have an unlimited data plan on your cell phone, you probably want to watch that you aren’t going over your monthly mobile data limits. It’s generally a good idea to keep a close eye on your data usage anyway. Pokémon Go does not appear to me to use an excessive amount of data, so it’s probably not a huge concern. 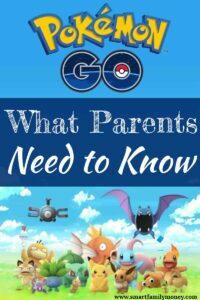 Have you tried out Pokémon Go with your family? Any tips for parents? Please share in the comments below! Previous Post: « What Do You REALLY Need for a Baby? Cindy, you have just cleared up my confusion about this game! Thank you! Glad I could help! That’s really funny about the dad. My husband and I went to a park hunting Pokemon last night (while our kids were away at camp) and I couldn’t believe the crowds! At least in the late evening, the average Pokémon player seemed to be a 25-year-old man. 🙂 And the park rangers came through with a loud speaker telling everyone to go home when the park was closing. “Pokémon players – the park is closed! It’s time to go home! You can catch more tomorrow!” It was hilarious!